Issue 5 of Limn is now available and focuses on the 2014 Ebola outbreak. It is a great resource for anyone interested in global biosecurity emergencies and how global health norms, logics and techniques can be problematised through the case study of Ebola. Ann H. Kelly on “Ebola, Running Ahead” – which looks at the design of clinical trials, asking the question: what does experimentation look like in the time of emergency? Nicholas B. King on “Ebola, 1995/2014” – which focuses on the dialectics of confidence and paranoia in the Ebola outbreaks of 1995 and 2014. Contributions are made by Lyle Fearnley, Ann H. Kelly, Nicholas B. King, Guillaume Lachenal, Andrew Lakoff, Theresa MacPhail, Frédéric Le Marcis and Vinh-Kim Nguyen, Alex Nading, Joanna Radin, and Peter Redfield. Thanks to Stephen Collier for the link to this. 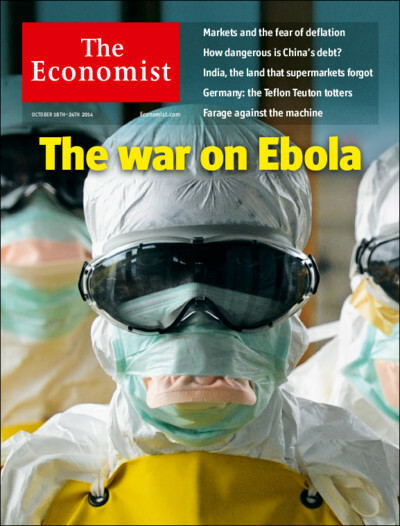 A great post by Derek Gregory on the metaphorical significance of ‘going to war’ on Ebola. We’ve been here before – ‘wars’ on this and ‘wars’ on that. It’s strange how reluctant states are to admit that their use of military violence (especially when it doesn’t involve ‘boots on the ground‘) isn’t really war at all – ‘overseas contingency operations’ is what the Pentagon once preferred, but I’ve lost count of how many linguistic somersaults they’ve performed since then to camouflage their campaigns – and yet how eager they are to declare everything else a war. These tricks are double-edged. While advanced militaries and their paymasters go to extraordinary linguistic lengths to mask the effects of their work, medical scientists have been busily appropriating the metaphorical terrain from which modern armies are in embarrassed retreat. Communication to stakeholders, at what point does this happen, and how the event is communicated. Useful resource on the Ebola crisis. Ebola is all over the front-pages of newspapers today, in part due to the Spanish nurse and the death of the Liberian in the US. The Guardian has a live blog with updates, and the World Bank has produced a report on the wider impact on the countries most affected. Much could be said of the shifting focus now the virus is having a direct impact on the West; of the economic focus of the World Bank report; and the militarised nature of the response from Western governments. I’ve added several pieces to the Ebola reading list on this site. Many of the pieces linked there provide a lot more detail than the headlines.